We are a very open company (with things like public annual and availability reports as well as public roadmap), and we thought we would share some analysis we have done as well as general thoughts on the future size and direction of the registration market. We do a biannual planning meeting (we start one on Monday) where we assess what we have done well and poorly over the past 6 months and figure out where we are going for the next 6-12 months and make sure we are on the right path strategically. As part of preparing for this meeting we realized we had grown quite a bit – but did not really understand in what context that growth was. So we will share some numbers we came up with. Our numbers are accurate and based on only races who had more than 3 registrations on RunSignUp (eliminating most test races and certainly the Calendar only races), but other vendor numbers are based on what we could find on the websites and may not include all of their business. If anyone has updates to their numbers they would like to share, feel free to comment on the blog or send an email to bob.bickel at runsignup.com. 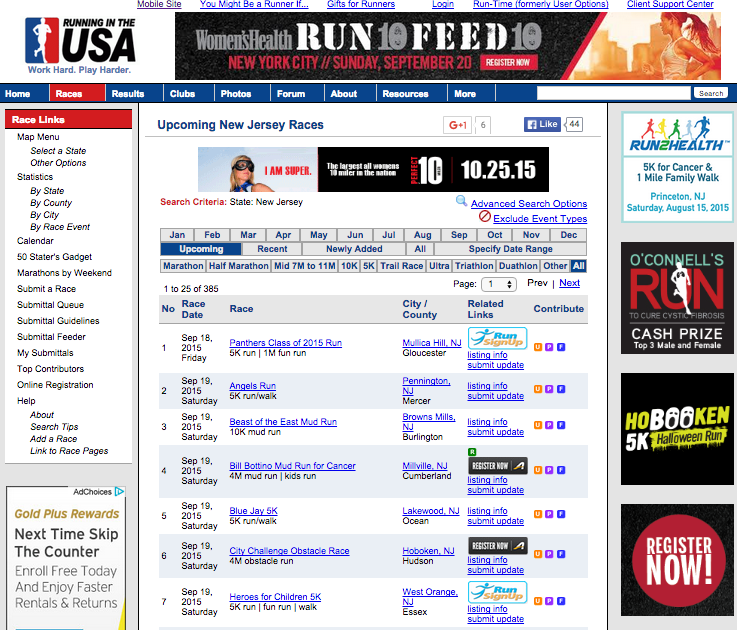 RunningintheUSA.com is the largest calendar of race sites in the US with 49,824 races listed. They use Active.com’s and RunSignUp’s automated API to load races from each of us – that is why you see the little logos for each of us on the calendar. This probably means that we are unfairly represented as they do not get every race from every other of the 100+ registration providers in the market. Doing a sample of 500 races in October, 28% of races had registration on Active.com and 18% were on RunSignUp. RunSignUp has had 9,009 races over the past 12 months that we have processed registrations for, which is 18% of the races in RunningintheUSA, so those numbers are probably fairly accurate. There are over 100 registration systems, and not all of them have race listings. For example I could not find a list of Chronotrack Live races, but know from their public statements that they processed over 1 million registrations in the first half of this year. Our objective in doing this was trying to understand how far we had gotten with our growth. It looks like we will hit close to 10,000 races that use RunSignUp for registration and close to 3 Million people who registered (not including imports). We are guessing that we are at about 10% market share – assuming there are about 30 Million Registrations in the US. It looks like this will put us as the leading endurance-only focused registration provider in the US, and second only to Active.com of vendors who are in this space. Next week, we will provide some perspective on how we see the registration market evolving to meet customer needs and take advantage of new technology. There is a LOT of change going on now, with registration providers becoming marketing engines for races as well as helping to make race day better – but we will save that for another blog.